We believe we have facilities second to none in the UK, and we have an extensive production capability that enables us to service very large contracts. Specimen Trees have 500 acres of open ground tree production, and around 200,000 trees in the soil at any one time. We are unique in providing the only only cold storage facility in the UK, which enables the planting season to be extended well beyond that of any other grower in the country. The benefit to specifiers is that we can assist with program delays enabling trees to be planted late or on demand. Specimen Trees operates it's own fleet of transport so we have full control of delivery schedules. All our trailers are bespoke designed for handling trees. 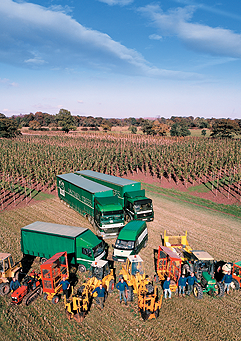 Our drivers are nursery trained, and will fully assist customers during off loading. We also have a separate and extensive container unit, available for Contract Growing. Specimen Trees are centrally located in the UK supplying anywhere between the north of Scotland and the south coast of England.